TheUSS Cole is one of 62 authorized Arleigh Burke-class guided missile destroyers, and one of 21 members of the Flight I-class that utilized the 5"/54 caliber gun mounts found on the earliest of the Arleigh Burke-class destroyers. In addition to her guns, Cole carries nearly 100 missiles of various types aboard two separate Mk 41 VLS magazines. Her superstructure features the AN/SPY-1 radar indicative of the Aegis combat system, which allows the destroyer to track over 100 targets simultaneously. She also has two Phalanx CIWS gun mounts located aft and stern which are intended to protect Cole against enemy missiles that manage to evade the ship's anti-missile missiles.Cole was launched on 10 February 1995 and commissioned on 8 June 1996. On 12 October 2000, while at anchor in Aden, theCole was attacked by Al-Qaeda suicide bombers, who sailed a small boat near the destroyer and detonated explosive charges. The blast created a hole in the port side of the ship about 40 feet (12 m) in diameter, killing 17 crewmembers and injuring 39. The ship was under the command of Commander Kirk Lippold. Cole was returned to the United States aboard the Norwegian heavy-lift vessel MVBlue Marlin owned by Offshore Heavy Transport of Oslo, Norway. The ship was off-loaded 13 December 2000 from Blue Marlin in a pre-dredged deep-water facility at the Pascagoula, Mississippi, shipyard of Northrop Grumman Ship Systems, Ingalls Operations. After 14 months of repair,Cole departed on 19 April 2002, and returned to her homeport of Norfolk, Virginia. The U.S. government offered a reward of up to US$5 million for information leading to the arrest of people who committed or aided in the attack on Cole. Al-Qaeda was suspected of targeting Cole because of the failure of a 3 January 2000 attack on USS The Sullivans, one of the 2000 millennium attack plots. On 4 November 2002, Ali Qaed Sinan al-Harthi, a suspected al-Qaida operative, who is believed to have planned the Cole attack, was killed by the CIA using an AGM-114 Hellfire missile launched from an MQ-1 Predator drone. On 29 November 2003 Cole deployed for her first overseas deployment after the bombing and subsequently returned to her homeport of Norfolk, Virginia on 27 May 2004 without incident. In 2005 Cole participated in BALTOPS 05 with the Baltic Nations. Cole returned to the US in early July and was able to attend Fourth of July Celebrations in Philadelphia. The Cole deployed to the Middle East on 8 June 2006 for the first time since the bombing. While passing the port city of Aden the crew manned the rails to honor the crewmembers killed in the bombing. She returned to her homeport of Norfolk on 6 December 2006 without incident. On 21 August 2006, the Associated Press reported that the Cole's commanding officer at the time of the bombing, Commander Kirk Lippold, was denied promotion to the rank of Captain. On 28 February 2008, the Cole was sent to take station off Lebanon's coast, the first of an anticipated three-ship flotilla. On November 12, 2009, the Missile Defense Agency announced that the Cole would be upgraded during fiscal 2013 to RIM-161 Standard Missile 3 (SM-3) capability in order to function as part of the Aegis Ballistic Missile Defense System. The Typhoon class ballistic missile submarine was developed under Project 941 as the RussianAkula class (Акула), meaning shark. It is sometimes confused with other submarines, as Akula is the name NATO uses to designate the Russian Project 971 Shchuka-B (Щука-Б) class attack submarines. Six Typhoon class submarines were built. Originally, the submarines were designated by hull numbers only. Names were later assigned to the four vessels retained by the Russian Navy, which were sponsored by either a city or company. The construction order for an additional vessel (hull number TK-210) was canceled and never completed. Only the first of these submarines to be constructed, the Dmitriy Donskoy, is still in active service with the Russian Navy, serving as a test platform for the Bulava (SS-NX-32) missile which is currently under development. The Arkhangelsk (TK-17) and Severstal (TK-20) remain commissioned, though not currently active with the Russian fleet. All the R-39 missiles have been retired. The Typhoons are slated to be replaced by the Borei class starting in 2010-11. In 2008 National Geographic released a documentary about the scrapping of one of the Typhoons in the series "Break It Down". Given the date of the documentary this is likely TK-12, which was scrapped over the time period 2006-2008. In late December 2008, a senior Navy official announced that the two Typhoon-class submarines, the TK-17 and TK-20, that are in reserve would not be rearmed with the new Bulava SLBM missile system. They could however be modified to carry cruise missiles or to lay mines, or could be used in special operations. In late June 2009, the Navy Commander-in-Chief, Admiral Vladimir Vysotsky told reporters that the two submarines would be reserved for possible future repairs and modernization. In May 2010 the Navy commander said, that Russia's Typhoon class strategic nuclear-powered submarines will remain in service with the Navy until 2019. Cyber-hobby has chosen another fine pair of naval vessel kits to combine in their new, inexpensive Orange range of kits. These are kits that have been previously sold individually, but are now available together, often at the same price as just one. Both kits are well molded with no molding glitches. The Cole has nicely molded bulkhead detailing and though it could benefit from photo etch for the radar and ladders (for example), it should please anyone who builds it. The kit can be built as a waterline version. The kit comes with a full hull and a display base. The Typhoon is actually pretty simple as are most modern submarines. 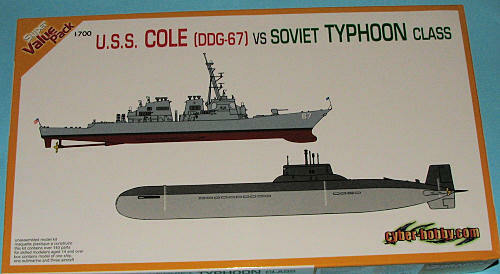 The sub comes with a display base and one can pose two of the missile tubes open showing two of the missiles. The sub comes with three US ASW aircraft; an S-3 Viking, P-3 Orion and SH-60B Seahawk. Each of these planes has a display stand. 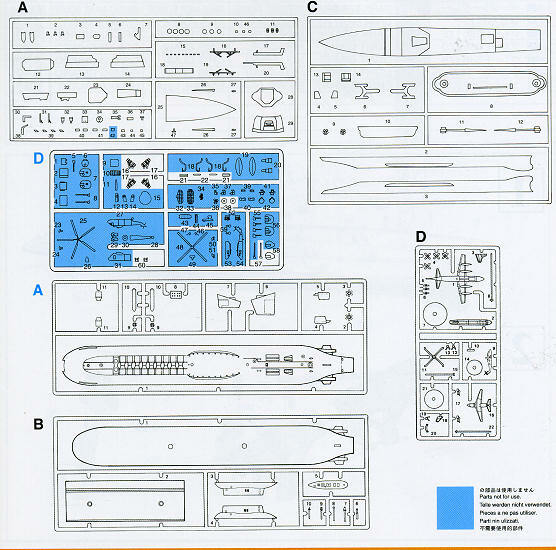 Instructions are well drawn with full color painting and markings guide that includes the assembly and painting of the aircraft. 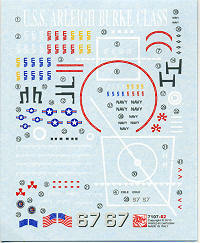 The decal sheet provides all the markings needed for both vessels and the aircraft. These Orange boxing kits are a real boon to the modeler on a tight budget that wants a quality kit. In this case, one gets double the model building entertainment. Both will look great when finished and won't take a ton of space on the shelf.